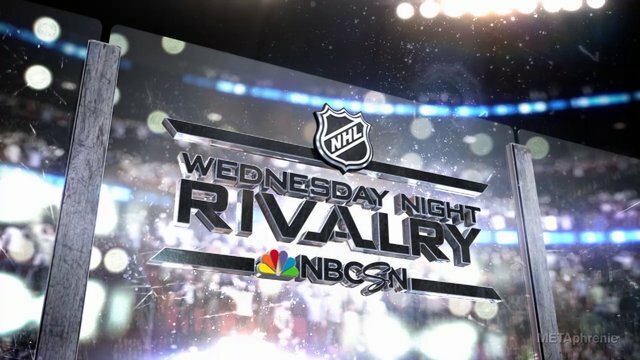 STAMFORD, Conn. – Dec. 1, 2014 – NBCSN presents a Central Division showdown on Wednesday Night Rivalry this week, when Jonathan Toews and the Chicago Blackhawks host David Backes and the St. Louis Blues on Wednesday night at 8 p.m. ET. Coverage begins on NBCSN with NHL Live at 7 p.m. ET. This week’s hockey coverage on NBCSN starts with a doubleheader tomorrow night, starting at 7:30 p.m. ET when Steven Stamkos and the Tampa Bay Lightning visit Tyler Ennis and the Buffalo Sabres. The second game of NBCSN’s Tuesday night NHL doubleheader features Claude Giroux and the Philadelphia Flyers against Logan Couture and the San Jose Sharks at 10 p.m. ET. NBCSN will present two Hockey East matchups this weekend as NBC Sports Group’s coverage of the 2014-15 college hockey season continues. The New Hampshire Wildcats host the No. 17 Boston College Eagles on Friday night at 8 p.m. ET, followed by a matchup between the Maine Black Bears and the No. 7 UMass-Lowell River Hawks on Saturday at 8 p.m. ET. NBC Sports Live Extra – NBC Sports Group’s live streaming product for desktops, mobile devices, and tablets – will provide live coverage of this week’s Blues-Blackhawks, Lightning-Sabres, Flyers-Sharks, New Hampshire-Boston College, and Maine-UMass-Lowell matchups. This week’s NHL pre-game coverage on NBCSN begins at 7 p.m. ET with NHL Live. Kathryn Tappen anchors tomorrow night’s studio coverage with analysts Mike Milbury and Jeremy Roenick. Liam McHugh hosts Wednesday night’s coverage alongside Milbury, Roenick and Bob McKenzie, who joins NBC Sports Group this year with more than 35 years of hockey reporting experience. St. Louis and Chicago renew their bitter Central Division rivalry on Wednesday night at 8 p.m. ET on NBCSN, in the Blues’ first trip to United Center since their Game 6 loss to the Blackhawks in the first round of the 2014 Stanley Cup Playoffs, ending their 2014 campaign with four straight losses. The Blues enter this Wednesday Night Rivalry matchup with wins in four of their last five games, including a 3-2 shootout victory against the Minnesota Wild on Saturday. Captain David Backes had the tying goal in the win, while leading scorer Vladimir Tarasenko had a goal and tallied the shootout winner. The Blackhawks have won six of their last seven games, including back-to-back 4-1 wins in Los Angeles and Anaheim last weekend. In their previous meeting this season, St. Louis overcame goals by Patrick Sharp and Kris Versteeg to defeat Chicago 3-2 on Oct. 25. Emmy Award-winning play-by-play commentator Mike ‘Doc’ Emrick, analyst Eddie Olczyk, and Emmy Award-winning ‘Inside-the-Glass’ analyst Pierre McGuire will have the call from Chicago. Steven Stamkos and the Atlantic Division-leading Tampa Bay Lightning travel to Buffalo to face the Sabres tomorrow night on NBCSN. Stamkos ranks fifth in the NHL in points (28) and third in goals (15) for the Lightning, who lead the NHL in goals scored (84). The Sabres have won five of their last six games, including a home-and-home sweep of the Montreal Canadiens last weekend. Tampa Bay looks to earn a season sweep of the New York Rangers tonight, and could move to the top of the NHL standings with a victory. Dave Strader (play-by-play) and Brian Engblom (Inside-the-Glass analyst) will provide live commentary from the First Niagara Center in Buffalo, N.Y.
Tomorrow’s NHL doubleheader on NBCSN continues at 10 p.m. ET, when Logan Couture and the San Jose Sharks host Claude Giroux and the Philadelphia Flyers. The Sharks look to build off a 6-4 win over Anaheim on Saturday night, led by two goals from Couture. In the Flyers’ most recent visit to San Jose last February, Giroux notched one goal and two assists in a 5-2 win over the Sharks. NBCSN presents two college hockey matchups this weekend featuring Hockey East teams, beginning on Friday night at 8 p.m. ET, when the New Hampshire Wildcats host the No. 17 Boston College Eagles. The Eagles look to rebound from a 1-0 loss to Providence College last Saturday, despite 37 saves from goaltender Thatcher Demko. Dan Parkhurst (play-by-play) and Ken Hodge (analyst) will provide live commentary the Whittemore Center Arena in Durham, N.H. The No. 7 UMass-Lowell River Hawks host the Maine Black Bears Saturday night at 8 p.m. ET in this weekend’s second Hockey East matchup on NBCSN. The River Hawks are unbeaten in conference play (5-0-2), and will host UConn on Wednesday night prior to Saturday night’s game against the Black Bears. Dave Strader (play-by-play) and AJ Mleczko (analyst) will have the call from Tsongas Center in Lowell, Mass. Note: Tomorrow night’s Flyers-Sharks game is subject to local blackouts. Tues., December 2 NHL Live NBCSN 7 p.m.
Tampa Bay at Buffalo NBCSN 7:30 p.m.
Philadelphia at San Jose NBCSN 10 p.m.
Wed., December 3 NHL Live NBCSN 7 p.m.
Wednesday Night Rivalry – St. Louis at Chicago NBCSN 8 p.m.
Fri., December 5 College Hockey – No. 17 Boston College at New Hampshire NBCSN 8 p.m. Sat., December 6 College Hockey – Maine at No. 7 UMass-Lowell NBCSN 8 p.m.